Alexander "Bozy" R. Thoburn Jr. Provide comfort for the family of Alexander "Bozy" Thoburn with a meaningful gesture of sympathy. Alexander “Bozy” R. Thoburn, Jr., 85, of Paden City, WV died Thursday, December 6, 2018 at his home while surrounded by his family. Alex was born January 13, 1933 in Paden City, WV; son of the late Alexander R. and Mary Irene (Minor) Thoburn. In addition to his parents, he was preceded in death by his sister, Mona Oblinger. He was a retired machinist for Bayer/Mobay, prior to that he worked ten years for PPG, a U.S. Army veteran serving during the Korean War, graduate of Magnolia High School Class of 1950, member of Wetzel Lodge No. 39 A.F. & A.M., American Legion Post 86, EMT for Paden City Squad, coached sports when his children were young and past president of the Band Patrons. He was a kind and loving compassionate soul and the best father anyone could ask for. 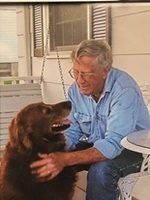 He loved his dogs, feral cats and wild birds and squirrels would come eat out of his hands. Very active member at St. Paul’s United Methodist where he served as the Sunday School Superintendent for over thirteen years and fifty-two years perfect Sunday School attendance. Surviving are his wife of sixty years, Marilyn (Lauderman) Thoburn; daughter, Valerie (Rick) Heasley of Paden City, WV; two sons, Alex (Judy) Thoburn, III of Paden City, WV and Stephen Brent Thoburn of Williamstown, WV; six grandchildren, Anastasia (Chris) Heasley-Riley, Brittany Heasley, Ashley Thoburn-Blatt, Chaz Heasley, Alexander Ryan (Amanda) Thoburn and Desiree Heasley; six and a half great grandchildren, Brendyn, Jaxon, Alex, Braelynn, Kohen, Azalyah, and in March 2019 another grandson and several nieces, nephews and cousins. Friends received 2-4 and 6-8 p.m., Saturday, December 8, 2018 at the Jarvis-Williams Funeral Home in Paden City. Funeral service will be 2 p.m., Sunday, December 9, 2018 at St. Paul’s United Methodist Church in Paden City. Burial to follow in Paden Memorial Gardens. Honor Guard will conduct military services at the church. Masonic Services will be held at the graveside. Memorial contributions may be made, in Bozy’s name, to either Wetzel County Animal Shelter, 399 Mollahan Dr., New Martinsville, WV 26155 or St. Paul’s United Methodist Church, 130 S Fourth Ave., Paden City, WV 26159. To send flowers in memory of Alexander "Bozy" R. Thoburn Jr., please visit our Heartfelt Sympathies Store. We encourage you to share your most beloved memories of Alexander "Bozy" here, so that the family and other loved ones can always see it. You can upload cherished photographs, or share your favorite stories, and can even comment on those shared by others. Provide comfort for the family of Alexander "Bozy" R. Thoburn Jr. by sending flowers. Thoburn family, I'm so sorry for your loss.My thoughts and prayers are with you.